The folder contains such files, development.config.js, staging.config.js, production.config.js etc. 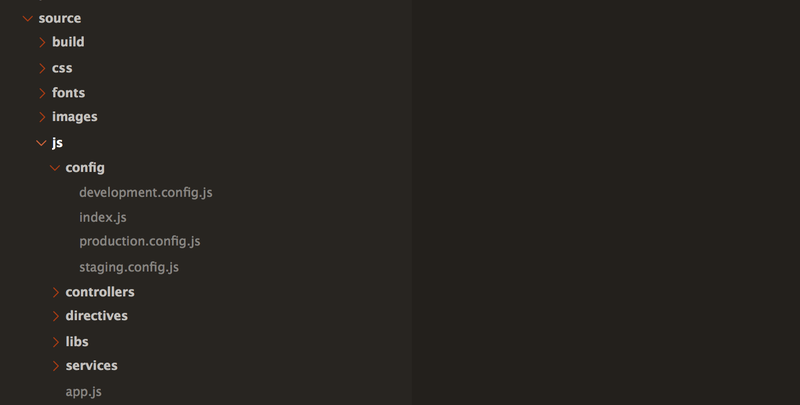 Usually, browserify is not run manually, but rather by means of JS build tools as grunt or gulp. I’m going to adopt Node.js config pattern for frontend with browserify. By analogy of node applications, let’s create a config folder inside our js folder. index.js file is exactly the same as mentioned above, config files contains application dependent settings. If you just try that, it would work as charm.. but only for development environment. The problem though, browserify have no idea what to put into process.env.NODE_ENV variable, since it is undefined – development configuration is always selected. Fortunately, browserify architecture supports, so called transforms, middleware components capable to customize browserify behaviour. One of handly transform function is envify by Hugh Kennedy. What envify allows to do is basically replacement of process.env.NODE_ENV to particular value, eg. This is exactly what we need, to make config/index.js work properly. Now, once the grunt build:dev or grunt build:prod is run, it will populate correct NODE_ENV value and the rest of transpiled application would work as expected.